Based on the recently released RS5, the re-invented RS5 sportback is a speedy 4 door version of the RS5 coupe. This sleek sedan boast a solid horsepower of 444 hp, worthy of the RS name which stands for max performance. With its twin turbo 2.9-litre V6 engine, 8 speed automatic transmission, and rear-biased all wheel drive, the RS5 sportback loses nothing performance wise compared to its coupe brethren. It has a 0 to 60 MPH time of under 4 seconds and a can reach a top speed of 174 MPH. The RS5 comes with large fender flares reminiscent of the original Audi Quattro. It also shares many similarities with the RS5 coupe including both the headlights and taillights, fat oval exhausts pipes, 19-and 20- inch wheels, and of course the RS-signature honeycomb mesh grille. The RS5 come in several chassis configurations, can come with dynamic steering, and carbon ceramic brake rotors. The interior is fit with specific RS sports seats, RS gauges, and a spacious cargo hold that rivals that of a station wagon. 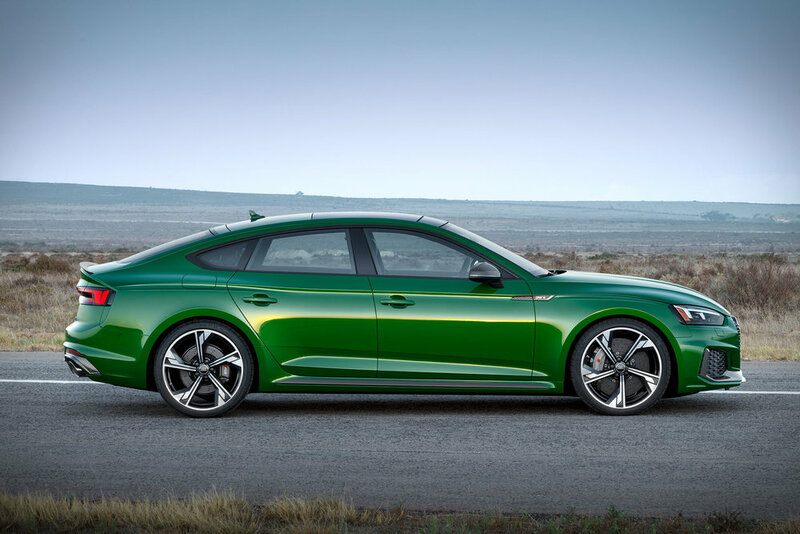 The RS5 sportback will be available in North America sometime in mid-2018.